At certain times in the life of the 1841 1d printing plates, they were re-entered by the engraver and touched up to elevate plate wear. 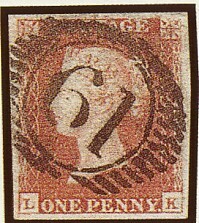 In most cases the re-entries can be seen as marks and lines at top or bottom edges and letter and star squares. The most famous and obvious re-entry is on LK from plate 75. The illustration clearly shows why it has been given the name of the Union Jack. The top stars are seriously damaged. SG CAT this popular variety at £700. A fine copy will easily fetch this sum at auction.